Place the pork sausage in a skillet over medium heat, and brown the sausage, breaking it up into crumbles as it cooks, until the sausage is thoroughly mixed together and no longer pink, about 10 minutes. Drain grease, and transfer the sausage to a large bowl. Mix in the croutons, oysters, celery, eggs, and onion until thoroughly combined. Mix together the reserved oyster liquid and enough chicken broth to total 2 cups in a bowl, and pour into the dressing; stir in the butter. Transfer the dressing into the prepared baking dish. Bake in the preheated oven until hot, browned, and the oysters are cooked, about 30 minutes. 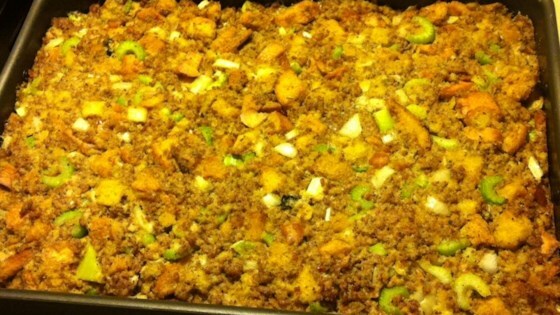 Made this recipe this Thanksgiving.... BIG hit! Different but really good. Added a little sage. Everyone liked the dish. If doubling the amount of oysters used in this recipe, would you use the liquid from BOTH of the oyster containers, or just from one? Thanks, in advance.